i am getting soooo very close to completing the tallest handmade book in the world! once it’s done, i will be emailing all participants so we can all shout out to anyone and everyone who may be interested in seeing it completed, and bidding on it silent-auction style. i am so excited! hopefully you are too. i had things on hold because there were about nine people who kept promising to send pages but life is buy and i don’t hold that against anyone, of course. just was hopeful that some of the late pages would come in. one of those people was my husband, who is a musician and not a visual artist, but he wanted to do a page. did he? nope. i still love him anyway. i have to be honest. i had no idea so many gorgeous pages would come in and i’ve had about 78 panic attacks thinking i would ruin the book that so many people put so much love and creativity into. i’m dumb sometimes and have to tell that self-doubt to shut the hell up, of course, but sometimes it still creeps in. so, to ensure i haven’t forgotten how to bind, i created three new books in practice. it’d been a year or longer since i’d made one, after all. wanna see? if so, scroll down. 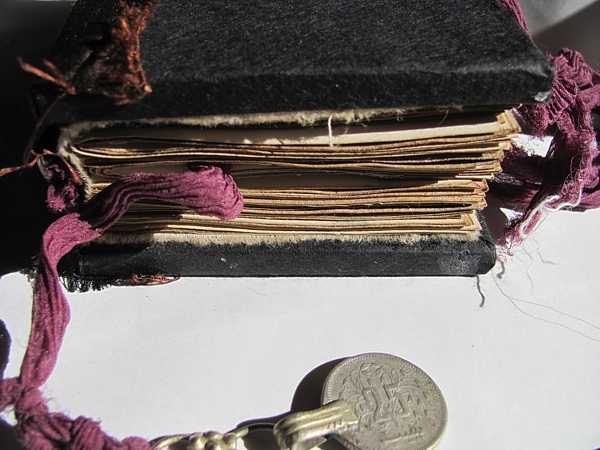 first, i created a little apothecary book. from left to right, the tiny bottles contain echinacea petals from flowers from my yard, a poppy pod and third, some dried english lavender flowers. the pages are created out of cold pressed water color paper which is great for painting, collaging or whatever as they are sturdy and tough. the paper on the front is more like fibrous fabric. it’s really, really cool and i think it was hand-made in thailand but i could be wrong. it’s covering black hand-made paper and i kind of like the effect. i have recently gotten quite a huge amount of these insanely cool middle eastern tribal coin charms — they are authentic vintage coins with metal loops soldered on. 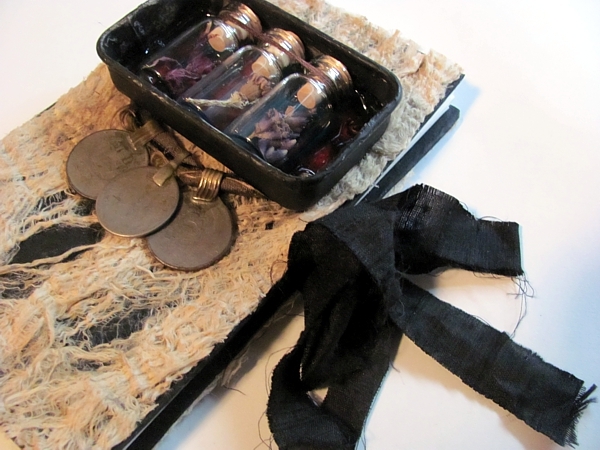 i have been using them like crazy in my books and assemblages. (i have some new ones up for sale here — they sell pretty fast though ’cause they are gorgeous: http://alteredbits.com/metal-glass-objects.php) i really need to retake some of the photos, but that’s a side note to self. anyway, the book has a tie closure like most of my books to help keep secrets safe inside (not that others can’t untie a ribbon and get hella nosy, but you get my point). 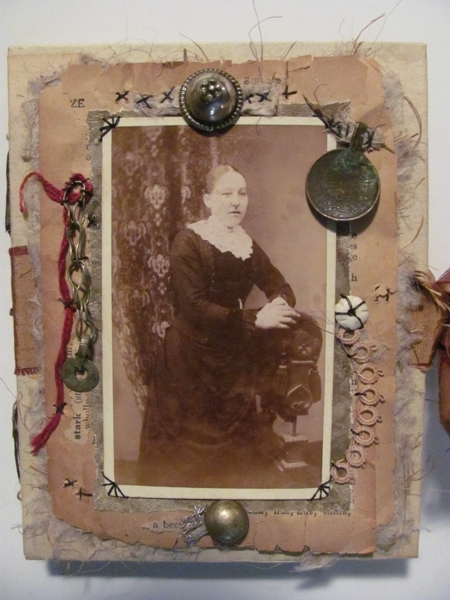 next, i was so inspired by this gorgeous carte de viste photograph which is one of many i received from my sweet friend emma in the uk, that i had to create this book with her image on the front. i want to do a series of them because i think it would be fun. i call this a “foremother” book because i’ve been hugely into genealogy lately and i always wonder what all these wonderful ladies and gentleman look like from my ancestry. (another side note: i am a princess. well, not really, but i should be — i am a decedent of a king in scotland.) 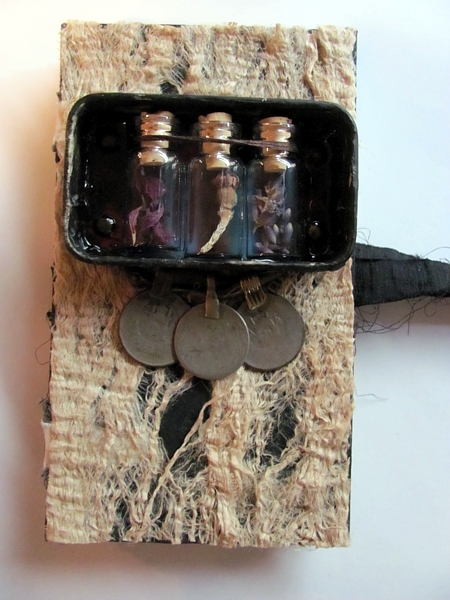 here i have used one of the more rusty and old coin charms along with some tribal metal beads and some tribal chain. i am so in love with these new finds! and i’m so not in love with how crap-tastic the above photo looks. i’m not good at photography when the sun isn’t out, sadly. this book ties shut too, of course, and to give credit where credit is due, all of my ribbons come from the gorgeous and talented lisa jurist of mudhound studio. 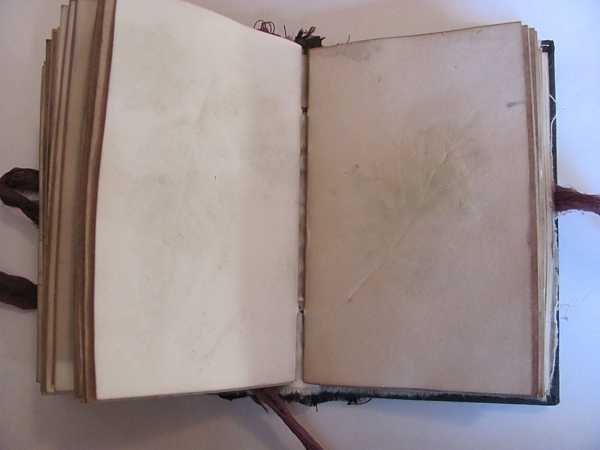 each of the pages are dyed and i have tattered the edges because i really wanted it to look as old as possible to give that feel of something handmade that had been passed down through the generations. kind of like an old relic or family heirloom. 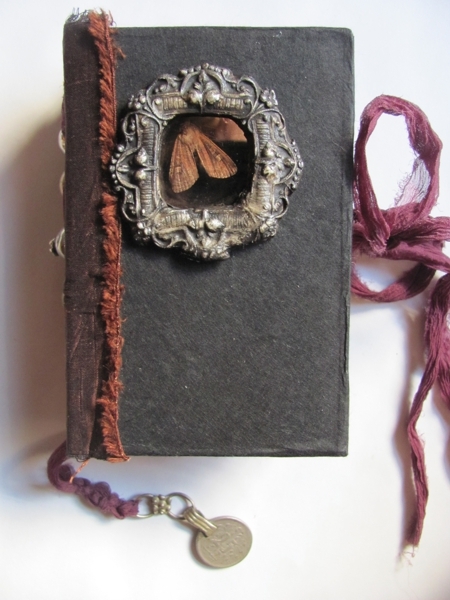 finally, this one, which is called the moth book. if you know me, you know how damn creative i can be with my naming! 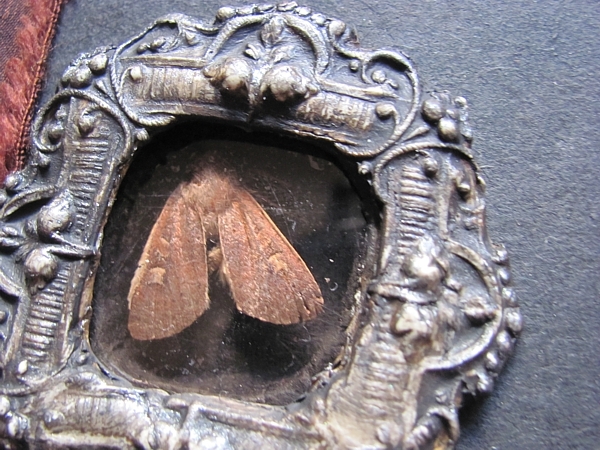 (that’s a joke — “the moth book” is not a creative name at all.) but the book is pretty darn cool if i do say so myself. 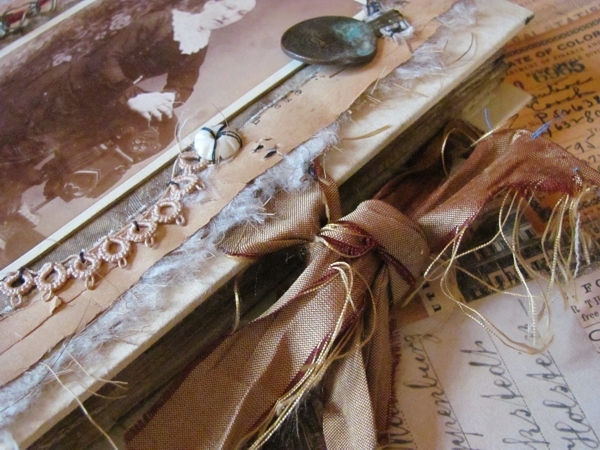 there is a silken bookmark with one of those gorgeous coins again, another tie-closure from lisa jurist’s amazingly beautiful ribbon, and on the spine, some of the lovely tribal metal buttons (again). this little moth died on my front porch and he was so pretty that i decided to immortalize him (or her??) in this book forever, under a piece of mica. the wings are so pretty! i love bugs (well, dead ones, sorry to say — some live ones scare the crap out of me), and am going to do a whole series of entomology books. i have some crazy horned beetles and other such things to use. the frame is a product of the first mold i ever made, and created with aves apoxie resin clay — i’ve just painted it to look a bit like metal. 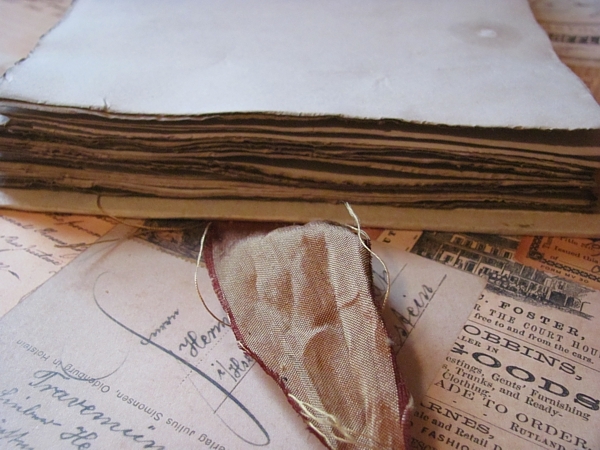 each of the 130 pages of this book have been hand-dyed with coffee, tea and handmade dye, most with the imprint of leaves and other bits of nature. i have never put that much work into actual book pages before — it was so fun seeing all of the pages hanging around my kitchen to dry, like little tattered paper flags. i’m definitely going to be creating more of these soon! please stay tuned, book lovers — my favorite art kiddos will be done with their handmade books soon and i soooo can’t wait to share photos. you will be so impressed! all we have left to do is bind and paint. 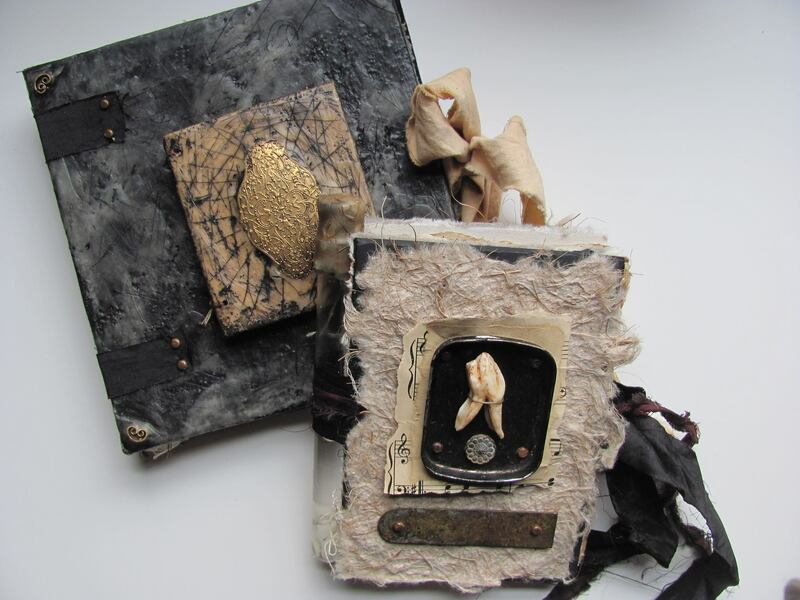 the covers are clay-covered book board with embedded objects and sculpted bits. they totally rock already but they will be even more magical once they are completed. with any luck, i will have four to share within the next week or three. also, stay tuned for more peeks at the tallest handmade book in the world because it’s getting so much closer to being done. the drawers are complete, the binding sort-of started, the covers almost done (back done, front is going through a bit of an identity crisis). i also still need to take photos of all of the pages. Hi! I’m just popping in from Art Every Day Month! I love what I see here – absolutely gorgeous stuff…. I hope you post lots of photos of the tallest book! What a blast! julie, i will most definitely be posting lots of photos. i tried to reply to your comment via email but it was returned — just wanted to let you know. so excited about art every day month! Im a huge art fan, im really blown away by your spontaneous work. I would love to be part of the long book, how do i get involved?